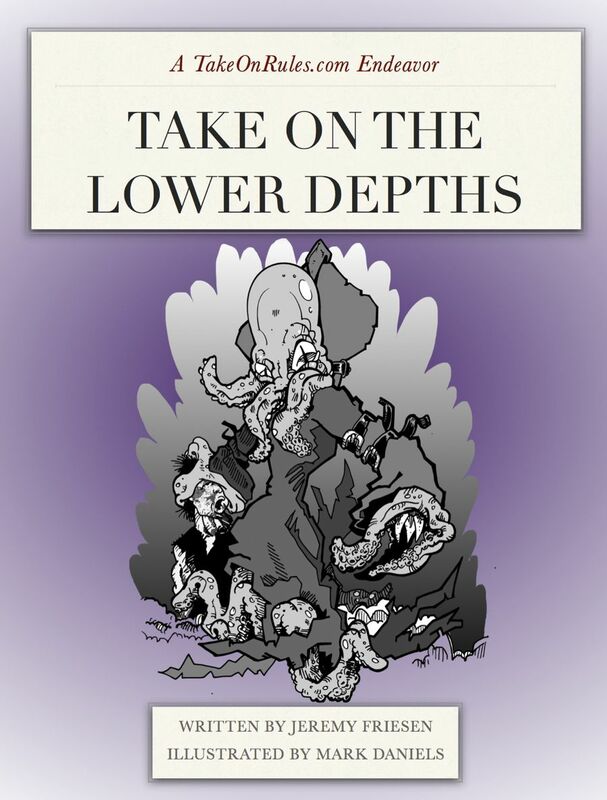 Today I released another Dungeon World supplement Take on the Lower Depths, written by me and illustrated by Mark Daniels. What follows was a prologue that I pulled out of Take on the Lower Depths. Originally, Take on the Lower Depths was going to be a conversion of Wolfgang Baur’s “Kingdom of Ghouls” – an adventure where the “traditional evil” of the Underdark had found a greater evil. Ultimately, the conversion wasn’t working out for me, so I scuttled the majority of it. In 2008, I learned about Open Game Design during Wolfgang Baur’s “Wrath of the River-King” patronage drive in – This was Kickstarter before there was Kickstarter. I was curious about the model, and I decided to sponsor Wrath of the River King on a lark…I was going through a divorce and decided I might have some additional time on my hands to participate or at least lurk about during the design process. What I found was an interesting adventure for a new game system (D&D 4E). I also saw an engaged group of gamers, eager and willing to contribute, blurring the lines between consumer and producer, designer and player. And they were still abuzz from Mr. Baur’s recent “Empire of Ghouls” patronage project. I did some research, and Empire of Ghouls was a re-imagining of Mr. Baur’s Dungeon #70 adventure “Kingdom of Ghouls.” I began digging deeper, and found the adventure intriguing. It was a seed that stuck in my brain. I was too late to the party to get “Empire of Ghouls” and use it in a 3E game, but I did manage to score a physical copy of Dungeon #70 on the cheap. I quickly read through the adventure, and the scope was impressive. In 29 pages, Mr. Baur had created a mini-campaign – A map with plenty of blanks, action offscreen, dangerous fronts, and grim portents. The simplicity of encounter setup was refreshing and rekindled old memories – especially seeing the then new direction of 2-pages per encounter. Every so often I would reach for my copy of Dungeon #70, re-read the adventure, and let it roll around in my brain for a bit. With my 2nd Edition books scattered to the wind, I wasn’t ready or eager to convert the adventure to another system – At the time, my personal options for systems were 3E, Burning Wheel, and Diaspora. With the development and arrival of Dungeon World, my gaming group and I were like a swarm of ghouls hungry to devour it. The rules had consumed me. The mechanics are simple. The focus is on the narrative. It was a breath of fresh air after choking through constrained 4E adventures that involved gruelingly long combats. And I began kicking around the idea of writing adventures. My first thought was TSR’s U1 “The Sinister Secret of Saltmarsh”, but it turned out that MJ Harnish beat me to it with his “DW-U1 The Haunting of Highcliffe”. I had even begun converting the Moathouse from TSR’s “T1-T4 The Temple of Elemental Evil.” But for some reason this never stuck. Then I decided perhaps I should turn my attention to something else. And that is when I once again reached to my copy of Dungeon #70 and began in earnest to convert the adventure. And as I was working on it, I realized that I really didn’t like the cloakers as allies for the true ghouls. It felt so very…lame. I needed something else. I wasn’t going to have vampires be the ghöls major allies, as I believe legions of vampires and ghöls would blur the nature of the ravenous ghöls. I decided to replace the cloakers with spiders. Similar types of creatures, but a lot less lame. I looked to the D&D monster manuals of 1E and 3E as well as Burning Wheel’s “Monster Burner” for inspiration. And then it hit me…why not create an archetypical spider for each of the archetypical D&D classes – Fighter, Thief, Cleric, Wizard. And thus the curate and eldritch spider were born, followed shortly by the reverent spider – its kind of like a Bard. The result is that now I have plenty of adversaries for more than one front each with enough space for distinct and possibly competing agendas…because lets face it what the hell is the agenda of a society of cloaks? To be dapper? To acquire monocles and top hats? Take on the Lower Depths by Jeremy Friesen is licensed under a Creative Commons Attribution-NonCommercial-NoDerivatives 4.0 International License. Based on a work at https://takeonrules.com/2013/05/20/take-on-the-lower-depths/. Permissions beyond the scope of this license may be available at https://takeonrules.com/more_permissions/.